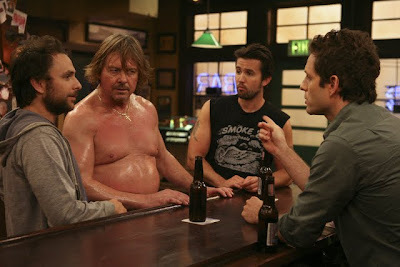 Cleverly courageous, constantly reinventing and consistently hilarious, the fifth freewheeling season of FX's fan-favorite cult smash It's Always Sunny in Philadelphia is the television equivalent of a shot of adrenaline delivered straight to the heart as the Paddy's Irish Pub gang return for twelve uproarious episodes. Of course, new terms like “d**k towel,” “kitten mittens,” and “Flipadelphia” have all entered the Sunny lexicon with their appearance in this most recent disc collection. Yet look past the quotable quotes as once again and frequently under the guise of the crass or extreme, Sunny has managed to tap right into issues facing us today from the recession and the mortgage crisis in just the first three episodes alone. Unfailingly timely and satirical, series creators, producers and stars Rob McElhenney, Charlie Day and Glenn Howerton;s Sunny gives SNL a run for their money on how to best blend topical events with humor so that every once in awhile we scarcely realize we're being served medicine with our sugar. However, just like you never want to see a performer “acting” nor someone “trying” to make us laugh or swallow their point-of-view, the staff writers, house directors and wondrous ensemble cast make sure that nothing gets in the way of being just flat-out naturally funny in order to put on the most blisteringly original series they can year in and year out. And given the fact that she's often forced by the wayside by the outlandish plots or played down a bit so as not to steal the male trio's thunder, for my money the show's most valuable player still remains the fearless and fiery Curb Your Enthusiasm alumni Kaitlin Olson. Easily the hardest working female sitcom star on television, Olson moves beyond the easy one-liners or stereotypical “hot girl with the fat guy” roles she'd be given on a network show to prove that comedy truly is gender-blind, moving as far past vanity or self-conscious niceties as she possibly can, knowing full well that not everybody needs to love “Sweet Dee” to love what she does as Dee. At its strongest when the series allows Olson and the endlessly hysterical Danny DeVito the opportunity to get onboard with the humor as equal members of “the gang” the show references in a majority of their episode titles, season five is an epic outing for the group with more intricate subplots than we're usually presented. Guaranteed laughter throughout all twelve installments, while Howerton acknowledges that the Blu-ray is a bit of a needless extravagance since there's nothing to “upgrade” in the visual format, from Frank making you want to destroy any pairs of skinny jeans you have in your closet to trying to pick up chicks at a funeral, the content more than makes up for the technical issues as a compact way to expand your collection. Filled with extras that don't even come close to entertaining us on the same level as some of the season's best episodes such as “The Gang Hits the Road,” “The World Series Defense,” “The Gang Wrestles for the Troops” and “Mac and Dennis Break Up,” among others, it's an imaginatively uproarious way to spend a few hours.